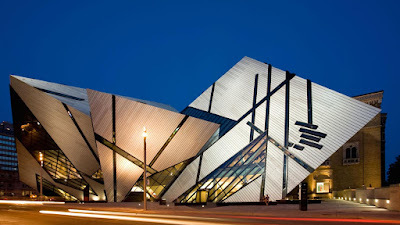 The wonderful entrance/front of the Royal Ontario Museum. There is a a tiny glimpse of the brick building it is attached to on the right. It was sad to leave my daughter in Kingston, Ontario, but after 4 days of fun it was time to start the journey home. Fortunately our first day back in the car was a short one. It was only 3 hours to Toronto where we would be stopping for the day. Traffic had a few slow spots, but mostly we breezed through and were delighted to find our first stop of the day - the Royal Ontario Museum (ROM) - was only a short distance from where we would be staying that night. 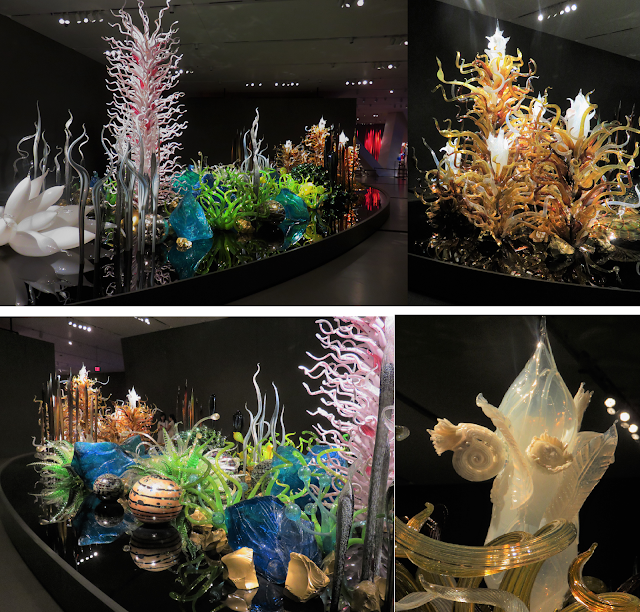 We had a tight focus for this visit to the ROM - the Chihuly glass exhibit. Glen and I have long been fans of this talented artist and have seen a piece here and there, but this was our first large museum show. We also decided to pop into the other special exhibit on Tattoos. I wasn't sure how interesting I would find it, but was honestly glad I went. Both of these are LARGE exhibits. Born in 1941 in Tacoma, Washington, Dale Chihuly was introduced to glass while studying interior design at the University of Washington and the rest is history. An injury forced him to stop glass blowing, so he now supervises a large team to bring his creations to life. His website is a must visit wonderland of images and videos. I really suggest you give it a look - www.chihuly.com/. to the glass makers of that city. This is HUGE!. I would guess 30 feet long and maybe 15 feet high. Chihuly has taken glass blowing to a new level with size, location and exhibition themes never approached before. From hanging chandeliers over the canals of Venice to the Light Of Jerusalem installation (over 1 million visitors) to a series inspired by disintegrating First Nation's baskets, he is one of a kind. All I can offer here is a few humble pictures from my small camera. You really have to see it live to appreciate the colour, intricacy and size of this exhibition. It's impossible to describe. Persian Ceiling 2012 - best viewing is laying on the mats provided. You really see the layering and small detailing from this angle. life to escape the extreme poverty of being a maid. tattoo'd man George Constantine made ($60 a week was a lot back then). Okay - I'm really not a big tattoo fan because of it's permanence. I love change. BUT I have many friends who do embrace it, so my visit to this exhibit really was in their honour. Where I turned my attention was an area I DO love and that's the history, culture and the journey of this art form from branding slaves to the cultural revolution it is today. I have included a few pictures with notes below. This covers a moment in history where tattoos were used to declare ownership of women. What had the most impact on me was one of the videos available to watch. It was on 92 year old Whang Od of the Philippines (I noticed her sign says Fang Od - not sure why the difference). You really need to see this. It gives the history of tattooing in her village and how it moved from the barter system to as way to earn much needed dollars. Visitors come from around the world to be tattoo'd by her. How they heard about her, I have no idea. Her equipment is primitive and it's no question it hurts (just watch the Western man getting a tattoo and covering his eyes to hide his tears). I also found it interesting that in her culture, the tattooist decides on where the tattoo will be placed. There are also designs she will only do on warriors. Located in Toronto's Distillery District, the award winning El Catrin Restaurant is one of my local favourites. The large outside seating area has the best atmosphere in my opinion, but it's on a first come first serve basis and the line-up can be very long. Reservations are taken for inside dining. No matter where you sit, you need to take a peek at the decor inside - amazing Day of the Dead themed with tons of colour and patterns. The food is served tapas style so you get to try a large number of tastes. El Catrin is an experience not just a dinner. Some Google Images shot by other diners. YUM! There were 5 of us this evening and as we didn't start to order until around 8 p.m., we were starving and ordered enthusiastically. I'm trying to remember everything we sampled, but not sure my memory is complete - Cocktails (everyone chose differently - Margaritas, Mojitas and one other), Guacamole and chips, Loteria Salad, Pand De Cazon, Pastelito De Cangrejo, Camarones En Pulque De Tamarindo, Gobernador,Gringa and not sure, but I think Pipan Poblano. No pictures were taken of the food as we were just too busy eating. The food was amazing! Note - Before or after your meal, I suggest you take time to explore the Distillery District. It's full of dining, shopping, culture, events and historic architecture. While we didn't have time this visit, I did a bit of exploring the previous time and intend to move it to the top of my list the next time I'm in town.